"Long ago, here and far away, people looked for clues in nature to predict the weather. They learned from experience by watching the shapes of clouds or noticing the behavior of animals. 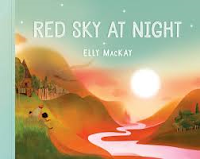 This wisdom was passed down ..."
Elly MacKay, whose magnificent artwork has graced the pages of If You Hold a Seed (2013), Shadow Chasers (2014), Fall Leaves (2014), Butterfly Park (2015), Maya (2016), Beach Baby (2016), Waltz of the Snowflakes (2017), and Forest Baby (2018), does it again in this ingenious book concerning many familiar weather sayings. We share the journey from one image to the next with a man (perhaps a grandfather) and two children as they spend time together and explore the beauty of nature. They spend time fishing, swimming, camping, sailing, and encountering weather fair and foul. It is quite the trip. Readers may or may not have heard each of the sayings - I had not. As their overnight camping experience enters its second day, they take notice that all nature is pointing toward bad weather. It is the encouragement they need to make tracks for home, and none too soon. "Red sky in the morning, sailors take warning! Trout jump high when rain is nigh. Hear the whistle of the train? 'Tis a sign it's going to rain."